Windows Aero Glass Transparency effect in Windows 7 (enable and fix Aero issue) makes the border frame of the all normal and maximized windows to have a blur outlay where user can have a translucent but frosted or milky glass blur effect window frame with partial blurred visibility of the desktop background with its icons or wallpapers. 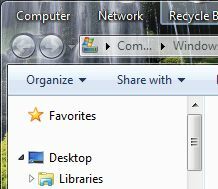 Some Windows 7 users may prefer to make these window frames or borders to fully transparent instead so that what’s behind can be clearly seen. In some builds of Windows 7, full transparency (non-opaque) window frame border can be achieved with a simple registry hack. Create a new DWORD (32-bit) Value registry value, and named it as HideBlur. Set the value data of “HideBlur” to 1. The registry setting at HKEY_CURRENT_USER will have priority and will override setting in HKEY_LOCAL_MACHINE if there is conflict. Log off and log in again or restart the computer. And the, window’s frame should be transparent. The illustrations below show the different of transparency effects before and after the border frame full transparency registry hack. Another note that the registry hack above appears to only work on some Windows 7 interim builds leaked by testers, such as build 6956, 7048, 7106 and 7127. It doesn’t been supported in Windows 7 Beta (build 7000), Windows 7 RC (build 7100) and build 7077. 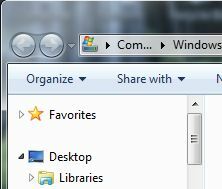 And unfortunately too, only window’s border frame can be made transparent, and not the Taskbar. For users who don’t want to modify the registry manually, download the following registry registration entries file: HideBlur.reg, and double click on it to apply full transparent window frame hack on current user. You can also save the following code into text file and save it as a .reg file. For users who use non-supported Windows 7 build versions, the window’s frame full transparency trick can be easily enabled by replacing two files “dwm.exe” and “uDWM.dll” inside the %systemdrive%\Windows\System32\ folder with the versions from Windows 7 Build 7127. dwm.exe evaluates the value of HideBlur registry key, and if the value is 1, the uDWM.dll will execute the transparency effect on windows’ border. For user without Windows 7 Build 7127 system on-hard, download the DWM.exe and uDWM.dll files extracted from DWM-7127.zip.